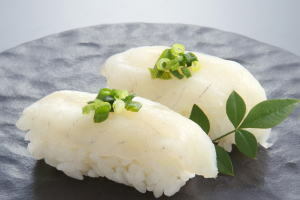 Fugu Nigiri Zushi ('河豚[フグ, ふぐ]握り寿司', is classified into sushi), is known as Puffer Fish Nigiri Sushi in English, and 河豚 握寿司 (Hétún wò shòusī) in Chinese. It is the washoku. Blowfish (Fugu Fish) Nigiri Sushi. *The puffer fish have the strong poison. If you want to eat a puffer fish, make a sushi chef cut it. Because the puffer fish have the strong poison. 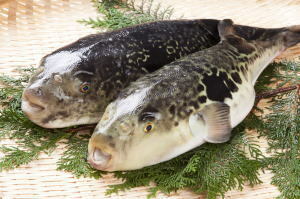 Fugu Nigiri Zushi is a hand-formed sushi that set a slice of fresh puffer fish on sushi rice. We can eat this dish at special kappo-ten (Japanese style restaurants) or fugu ryouri-ten (puffer fish restaurants) in Japan.